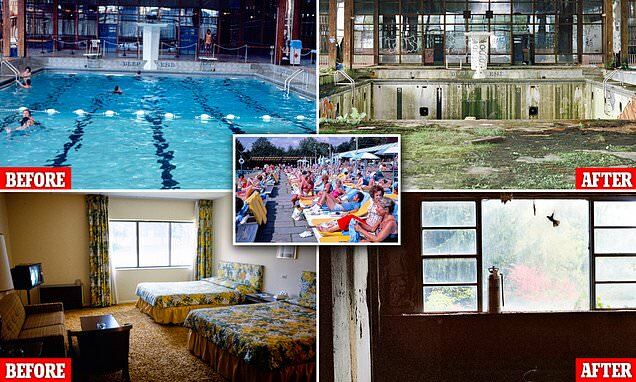 A Brooklyn-born photographer says you're not looking hard enough if you don't see the incredible stories told in images of the abandoned American Jewish vacation resort of the Borscht Belt. Marissa Schienfeld's book The Borscht Belt: Revisiting the Remains of America's Jewish Vacationland shows eerie images of what the place - regularly referred to as the Jewish Alps at its height of popularity - looks likes now. The collection of hotels situated in the Catskills Mountains, New York, was photographed for a 2009 university project, decades after Jews first started using it as a getaway spot, but she admits many people didn't understand why she was snapping pictures of derelict structures. 'These photographs are like these still lifes arranged by time, change, Mother Nature, and other people who have been going in there to hang out, party, photograph, live, and steal,' she told Huck magazine. 'Most people didn't understand what I was doing at first. I would often get the remark, "There's nothing there. Why do you want to go there? You're crazy." From the 1920s to 1970s while many Jewish people were not welcomed at mainstream hotels across the US, Schienfeld's family was one of those who traveled upstate from New York City to enjoy the spot that went on to serve as the inspiration behind the famous Kellerman's Resort in 1986 flick Dirty Dancing.